With “forward look” styling from the Virgil Exner design studios, and powered by the famous Chrysler 331 Hemi V-8 Engine, the New Yorker was a leader in styling and performance. It was often the car of choice among up-scale buyers in 1955. The “forward look” was the Chrysler Corporation’s term for styling that seemed to leap past that of its rivals. 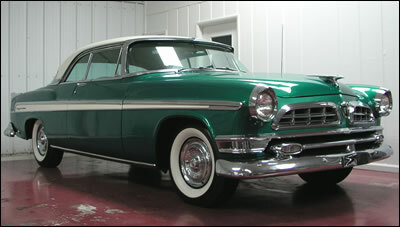 There is no doubt that the 1955 Chryslers were handsome cars, not only in their day, but also in ours. They still look clean and stately. It was in 1955 that Chrysler began to take over design leadership, so long held by General Motors. But by 1957, GM was hastening to catch up. This 1955 Chrysler New Yorker Hardtop is remarkably original. With less than 60,000 miles on the odometer, it has obviously been carefully maintained. Its history can be traced back to the day, almost fifty years ago, its proud owner took delivery from the showroom floor. Power steering, power brakes, Powerflite Automatic Transmission and, of course, the powerful Hemi V-8 engine are among the features of this fine automobile.